So it’s time to load up and move into that new home! Congrats! There are several ways to go about getting everything from point A to point B. From using professional movers to getting the job done yourself! If you decide to save some money and rent a truck to do the job yourself there are many things that can make the job much easier. This article will give you some tips on the best way to load a rental truck. 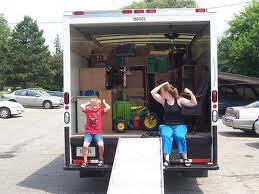 Loading a moving truck the correct way is so important for many reasons. Weight distribution, movement, and use of space. For this example we will use a standard one bedroom apartment. Start with the mattress, next goes the box spring, this will hold the mattress up. Against the mattress put the head-board and foot board. Tie this section off with rope. This will hold that mattress up solid. Next goes the dresser, put boxes on top of the dresser, load the chest of drawer sideways beside the dresser, stack boxes on top of both until they reach the top of the mattress. Now put the kitchen chairs on top of the mattress and box springs. Next load any square items like washer, dryer, buffet, entertainment center, etc tie off this section. Next comes the couch load it long ways and facing backward. Place coffee and end table inside the couch, or T.V. if you have an older square one. Remove the legs to the kitchen table and put it flat against the back of the couch, tie off this section. miscellaneous or misshapen items like grills, bicycles, etc should go on the end of the truck. Mirrors, glass, pictures, etc items that are too big to put in a box and are fragile should be placed between the mattress and box springs. Wrap it good with a moving pad or blanket and shrink-wrap and it will ride there with no problem. The tighter the stack the more secure the load will be to prevent shifting. If in doubt tie off a section to hold it secure and fill any gaps with miscellaneous items, like bedding, pillows, couch cushions. Use plenty of moving pads and a roll of shrink-wrap will go a long way and is an inexpensive solution to keeping drawers, doors shut while moving furniture. Having a door to the china cabinet swing open on you halfway up the ramp is not fun, as they are usually made of glass. Remember, it’s always a great idea to call your local mover and compare the price of leaving to the professionals, to the cost of renting a truck, paying mileage and fuel, renting dolly’s and moving pads. You may be surprised at how affordable it really is, and your back will feel better in the morning. Good Luck on your venture, and share your ideas, we love to hear from our loyal readers!